While casual investors are likely to think price moves follow the news, many traders are inclined to think news follows price moves, at least in the short term. Take yesterday, for instance. Did worries about resurgent Treasury yields and trade wars send the market south, or did the market going south trigger enhanced fretting (and headlines) about Treasury yields and trade wars? Both stories, after all, weren’t new at 9:30 a.m. ET yesterday. And then there’s the other story: The divergence in small-cap stocks. What started as minor underperformance a couple of weeks ago has mushroomed into a genuine slump. In fact, as of yesterday the Dow had actually jumped ahead of the Russell in terms of year-to-date return. Some analysts chalked up the recent small-cap swoon to everything from pure exhaustion (everybody who wanted to get into small caps is already in)1 to institutional portfolio reallocation.2 And given yesterday’s market-wide downturn, some investors are probably wondering whether the RUT’s slide was signaling a chink in the bull market’s armor. Such musings will happen when the broad market drops more than 1% (especially in October). At such moments, it’s always a good idea to take a step back and consider the big picture. Since the financial crisis low in March 2009, the RUT has out-returned the DJIA approximately 290% vs. 249%. The following weekly chart comparing the two index’s percentage returns since the February 2016 market low shows that while the Russell has usually outperformed the Dow, it repeatedly pulled back to points where, like now, its return was about the same as the Dow’s. Those Russell retrenchments (for example, May, June, and October 2016, August 2017, February 2018) were followed by rebounds. Two points: First, this relationship has occurred in the context of an ongoing bull market, so it may only have implications in the event the bull market is still intact. There is, of course, always the chance a bear market (as opposed to a pullback or correction) will emerge. 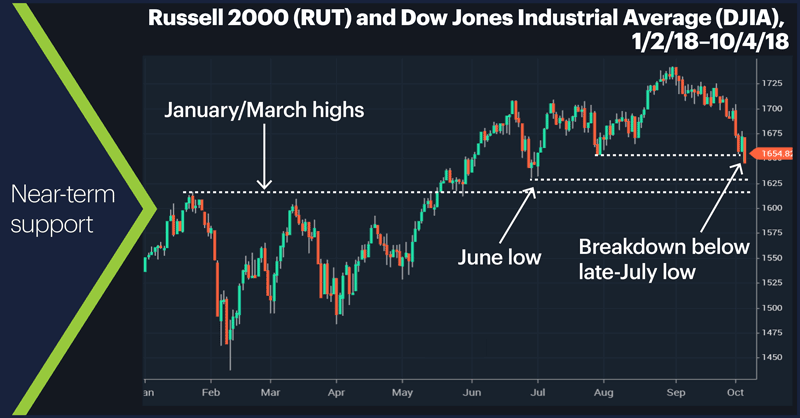 Second, the pullbacks marked in the Russell-Dow chart typically formed over three to six weeks, sometimes more; it’s a real challenge to precisely identify market bottoms in real time. But who said trading was easy? With that in mind, it may be helpful to look at the daily RUT chart again. Yesterday the index broke below its July low (falling to around 1,643 intraday), setting up a potential test of support at the June low around 1,630. The next obvious support is the zone defined by the January and March highs (which the index tested in late May). 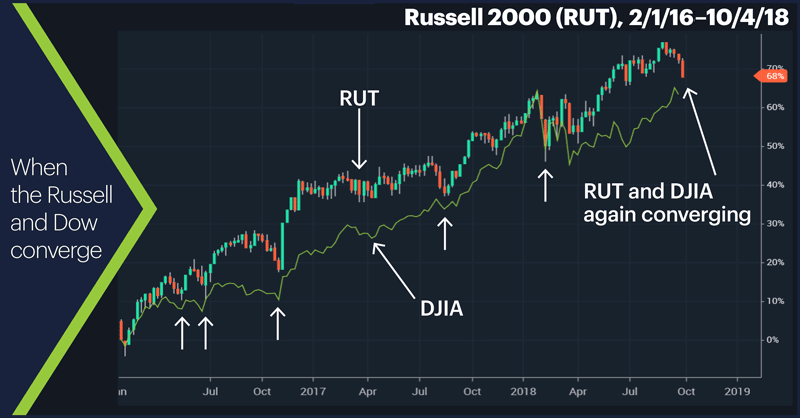 The big-picture Russell-Dow relationship suggests the RUT isn’t really behaving out of the ordinary. The short-term price action may soon indicate whether that’s the case. Today’s numbers (all times ET): Employment Situation (8:30 a.m.), International Trade (8:30 a.m.), Consumer Credit (3:00 p.m.). 1 U.S. News & World Report. Can Small-Cap Stocks Keep Their Momentum? 9/26/18. 2 Real Money/TheStreet.com. Major Rotation Continues as Small-Caps Are Dumped for a Second Day. 10/2/18.